97% of a mixture of 5 seeds (canary seed, millet, yellow millet, red millet, bold) enriched with vitamins (A, D3, C, PP, E, B2, K, B1, B12, Calcium D-Pantothenate, folic acid), amino acids (methionine, choline), minerals (calcium, magnesium, iron, manganese, copper), prebiotics, and probiotics. PRO.EXOTIC is a food for exotic birds made by 97% of a mixture of 5 seeds (canary seed, millet, yellow millet, red millet, bold) enriched with vitamins (A, D3, C, PP, E, B2, K, B1, B12, Calcium D-Pantothenate, folic acid), amino acids (methionine, choline), minerals (calcium, magnesium, iron, manganese, copper), prebiotics, and probiotics. PRO.EXOTIC is an innovative product created to replace the mixtures of conventional seeds. Is presented in the form of granules ready-to-use and offers the same benefits of the traditional seeds but reduces the negative aspects associated with their use. It is not a unifeed (RTM), does not cause “doré”, and does not affect the natural color of the plumage and does not affect the habit of the exotic birds of the consumption of mixtures of conventional. • Those who have serious problems of mortality. • Those who are tired of having problems with the blends of traditional seeds. • Those who want to reduce waste and optimize costs. • Those who have little time for the cleaning of the cattery and do not want to leave the benefits of the seeds. • Looking for a diet rich and of high quality. • Those who wish to have a kennel cleaner. • Those who are attentive to the nutritional needs. • Those who want a constant improvement in the management of the kennel. What are the ADVANTAGES of PRO.EXOTIC ? • Has a bacterial load is reduced (lower mortality rate). • Have a better digestibility. • Provides a food intake is well balanced and of high quality. • Promotes a better growth. • Vitamins, minerals, prebiotics and Probiotics to guarantee a basic integration of the daily diet and stimulate the immune system. 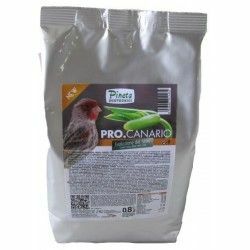 • The seeds are conventionally used for the feeding of the exotic birds are to be combined in a single product; that way all of the subjects consumed a balanced mix of 5 seeds: eliminates, therefore, the problem of the selection of the seed preferred by the exotic birds. • The better health of the product helps to reduce the percentage of mortality and the cases of the appearance of the “Black Point”. • Does not cause “doré”, and does not affect the natural color of the plumage. • Is ready to use. • Completely eliminates the waste. • Reduces the costs of management of the kennel. • Substantially reduces the duration and the frequency of cleaning in the nursery by the breeder. Description: Pro.Exotic 4kg (97% seed) 97% of a mixture of 5 seeds (canary seed, millet, yellow millet, red millet, bold) enriched with vitamins (A, D3, C, PP, E, B2, K, B1, B12, Calcium D-Pantothenate, folic acid), amino acids (methionine, choline), minerals (calcium, magnesium, iron, manganese, copper), prebiotics, and probiotics.